Nowadays, if you’re not on Netflix, you’re out of the loop. Even those who are in the loop however, can learn a little more. There’s more to binge-watching than just “that day you regret” - Netflix also knows which shows you'll most likely binge-watch. With these tips, not only will your binge-watch experience be a little better, you’ll feel less guilty for doing so. Check out our Netflix coupon page for ways to save on your subscription! 1. What time you watch matters. Traffic affects the quality of Netflix streaming, so aim for hours such as early in the morning when it won’t be as busy. If you’re a morning person, breakfast is a great time to squeeze in an episode. If you have enough time to make yourself an omelet, that’s an episode of Orange Is the New Black you can have on while beating those eggs. In a hurry and having cereal? Put on a shorter show like Friends. If you’re a night owl, watch at an hour when everyone else is asleep. 2. There are hidden categories. Don’t like the suggestions you’re getting? Check out our blog post about Netflix's Hidden Categories and browse numerous genres you may not have even known existed. From “Military Dramas” to “Werewolf Horror Movies,” you’ll be sure to find something to your liking. That way, you’re watching something you really want to watch, not just something you resorted to. 3. Rate what you watch. Another way to make your Netflix experience more personal is to rate what you watch. If you don’t rate, you’ll keep getting suggestions for those cowboy westerns you have no interest in. Just hover over the program and click on the stars. If there are no stars available, click on the down arrow and they’ll be there in the overview. Sometimes, you watch something you absolutely did not enjoy at all. This would be fine, if Netflix didn’t now offer you a bunch of other titles similar to it. By deleting it from your history, it’ll no longer affect your suggestions. Simply hover over your name, click “Your Account” and “Viewing activity”. Then, click the “X” next to the title. >> SEE MORE: Amazon Prime vs. Hulu vs. Netflix: Which Service is Right for You? 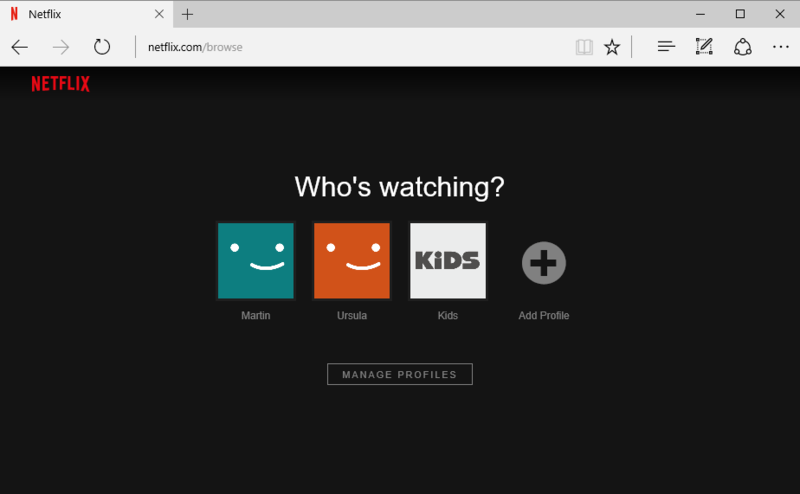 Netflix profiles were designed for multiple users, but what if you’re the only one who uses the account? With five different profiles allowed, why not make profiles for different categories you’re interested in? After all, just because you like slapstick comedies doesn’t mean you don’t enjoy a documentary once in awhile. Instead of someone’s name, title the profiles as genres. Hate when Netflix asks if you’re still watching? Yes I’m still watching and I would appreciate if you didn’t make me feel bad for it! If you use Google Chrome, you can get an extension called Netflix Pause Removal that will allow you to binge watch guilt-free. Say goodbye to clicking “Continue Playing” and hello to a relaxing evening with no interruptions! If you want the opposite, and would like to stop the next episode from playing whenever one finishes, you can turn off auto-play. Simply hover over your name, click “Your Account”, and scroll down to “Playback Settings”. There, you’ll have the option to uncheck the box that says “Play next episode automatically”. It’s a great idea for viewers who like watching late at night. If you’re not the type to spend time and money on those Netflix socks that pause the program when you fall asleep, this may be a simpler way to gain control during your slumber. 8. Sign out of all devices. If you’ve signed into your account on a device you no longer use, or gave your password to a friend, that could affect your ability to watch. Although Netflix allows up to six devices, it only allows two streaming at the same time. As a result, you may get a note that says your account is already in use. When this happens, you can hover over your name, click “Your Account”, and “Sign out of all devices”. For situations where you no longer want someone using your account, change your password after you sign out of the devices. 9. Work out while watching. If binge-watching makes you feel unproductive, choose an activity you can do at the same time. Doing some cardio or yoga with Netflix on auto-play is a great way to keep your mind occupied while your body’s working hard. Not only will your exercise time fly by, you’ll be excited to start in the first place! If you want to push yourself even more, make a rule for yourself that you’re not allowed to binge watch unless it’s your workout time. 10. Watch with a buddy. You used to have to count “1, 2, 3” over the phone to watch a movie with a friend. With Rabbit, you can watch things with up to ten people over video chat. It’s a fun activity to do instead of the usual Skype call, and will make those long distance friendships and relationships a little more bearable. Love the blog really appreciate the idea !! !